Another new Pokemon was revealed for the upcoming Pokemon 3DS titles today. It's a Pokemon kind of day, what with Pokemon Go being released last night officially for the entire world, and a brand new Pokemon revealed today from the upcoming Pokemon Sun and Moon for Nintendo 3DS. It's called Salandit, and it's quite interesting. It looks almost like a frog and a lizard at the same time, a bizarre combination belonging to the poison/fire type category. As a "Toxic Lizard Pokemon," it can emit toxic gas and blames from the base of its tail. But the gas it emits has a sickly sweet smell that makes anyone who happens to breathe it in dizzy. Salandit isn't very powerful, but makes up for those shortcomings with its cunning and toxic gases. It also features the Corrosion Ability, which no other Pokemon has ever had before it. It allows Salandit to inflict Poison on Steel and Poison-type Pokemon. 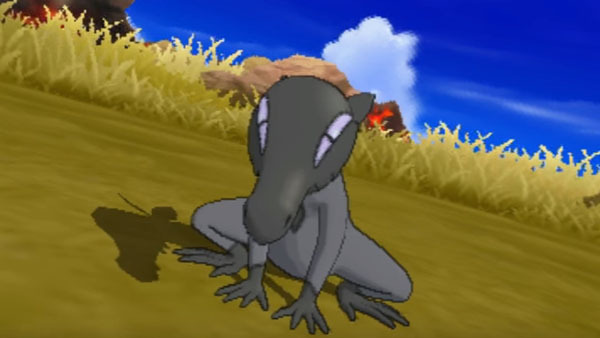 You'll be able to get your hands on Salandit in Pokemon Sun and Moon this November 18 when it releases on 3DS.